The very thought of vegetarian (or god forbid, vegan), is enough to make some people recoil in disgust. You may think I’m exaggerating, but vegetarian food is usually associated with tastelessness, which is an additional turnoff for some meat-lovers. Thus, my interest was piqued when I heard about not just a vegetarian and vegan-friendly restaurant, but a dessert bar. 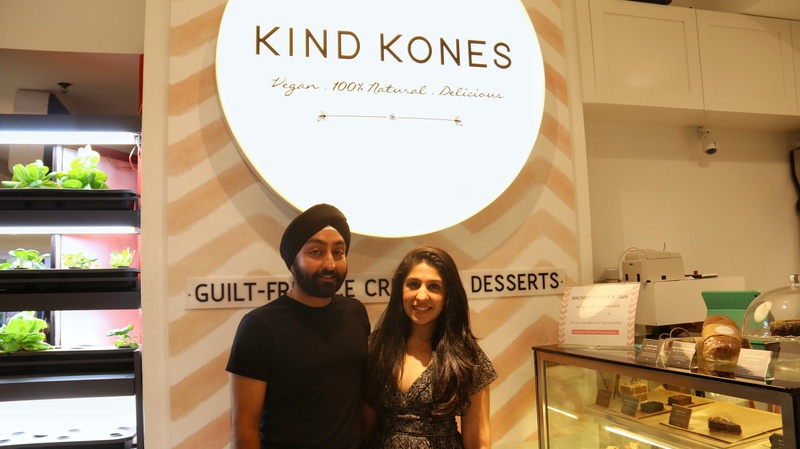 Founded by Serina and Ishpal Bajaj, a wife and husband team, they believe that Kind Kones is the first of its kind here in Malaysia. 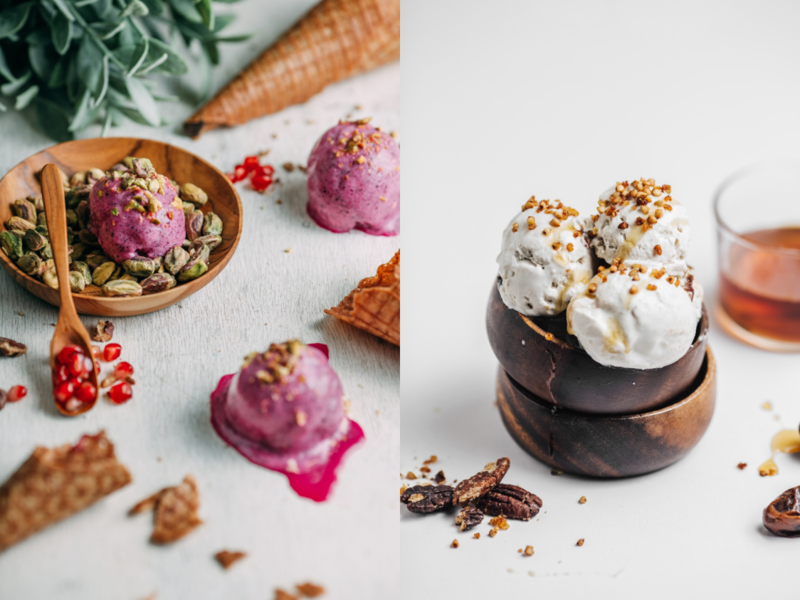 The star of their space is the ice cream, which is free from eggs, dairy, refined sugar, emulsifiers, preservatives, additives, artificial colouring and flavouring. 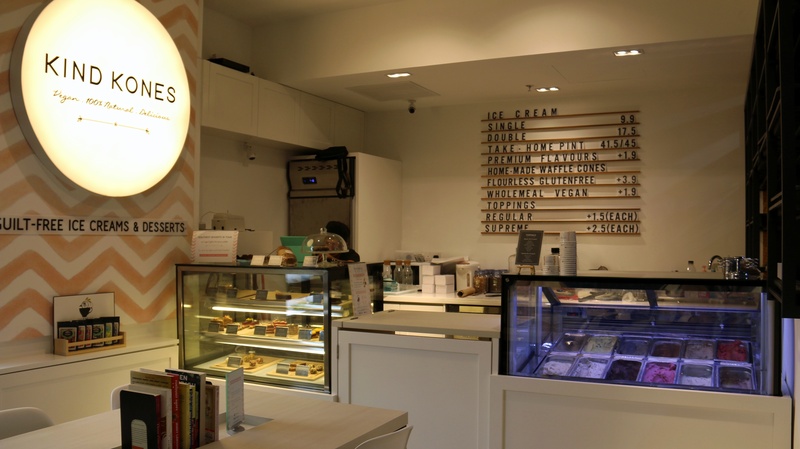 Located in 1 Mont Kiara, they also offer various pastries and desserts, which come with gluten-free, vegan, dairy-free or raw options. For the uninitiated, “raw” food (as the name may hint) is all about eating uncooked and unprocessed food. But why start a vegan dessert bar, of all concepts? “It’s all for my daughter, she’s my inspiration,” said Serina. Serena hails from Bangkok and by trade, she’s in the fashion line. However, when it comes to Kind Kones, it’s all about passion. Kind Kones was launched just over a week ago but this isn’t their first foray into the F&B industry in Malaysia. Serina and her husband co-founded Raisin’ The Roof, a healthy vegetarian restaurant in Plaza Damansara. They noticed how well the desserts were doing, and realised there was a market for sweet, healthy and vegetarian treats here in Malaysia. When it comes to running the business, Serina and Ishpal are a dream team. He handles the backend, the inventory and HR. On Serina’s part, she deals with marketing, PR and very importantly, product development. Their offerings aren’t just about being vegan or vegetarian either. Instead of eggs and dairy to get that smooth ice cream texture, they substitute it with coconut milk or nuts, or a mixture. Her love for family and community shows up in the decor and setup of Kind Kones. There tables are communal, and there’s even a mini-sized table with accompanying chairs to accommodate the little ones. Another nice touch is the book exchange set up in the tables, where customers are welcome to bring books of their own to swap. It all works on an honour system, and to her delight, the books increased rather than disappeared. Giving back is important to her too, and the unsold products from Kind Kones are donated to orphanages. To ensure top quality for paying customers, the ice creams are phased out after 3 to 4 days. According to Serina, the ice cream is still good if consumed within a week—she takes back pints for her own family out of the “leftovers”. Serina also told us about plans to have ice cream parties in an school-initiative established by Deborah Henry, who works with refugee children. “The kids will have a blast, it’s good for them and it’s healthy,” said Serina. They do plan on expanding the brand to more locations. They’re also planning on sourcing out to cafés in the future, once things fully on the ground and settled. However, before they can hit mainstream appeal, they will have to overcome certain prejudices. “I was very much debating on whether to put vegan into the tagline because it intimidates a lot of people. I’ve had people walking past who associate vegan with blandness, and grass, so they wouldn’t even enter,” she said. However, they recognise that they aren’t going to win everyone over. “They try the food then say, ‘It’s actually pretty good!’ and I see that as a good sign. I really believe that it’s a start of something,” said Serina.